Heat Shrink Wrapping – How to Get That Million Dollar Look! Heat Shrink Wrapping – How to Get That Million Dollar Look, On a Budget! Today I want to talk about one specific packaging method that is cheap and can be used in various scenarios – Heat Shrink Wrapping! 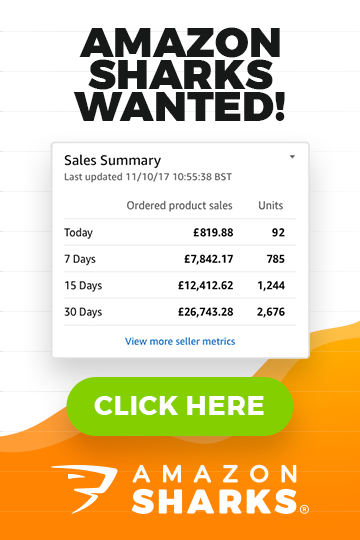 Even if you don’t realise it, you’re already very familiar with this method of packaging – you see it all the time at your local supermarket but you’ve probably never thought about the ways it can be used for your online business. So let’s take a closer look at how it all works, in what situations it can be used and why some products absolutely MUST be heat shrink wrapped to be sold online! What is Heat Shrink Wrapping? While there are many uses and applications of this packaging process, the principle stays the same – the item is wrapped in special plastic film and then heat is applied to shrink it so that it takes the form of the product. As already showed in previous examples, this method is widely used in many industries, especially in the retail environment. Most packed goods that you see in your local supermarket are shrink wrapped. They will have a cardboard bottom but the products themselves will be shrink wrapped in plastic. This is a much cheaper way of “boxing” items than to use full sized cardboard boxes! It is plastic though so it’s probably not the most eco-friendly way of packaging goods, but that’s a topic for another post. 1) Create a tamper-proof seal. So that your customer knows that the product is BRAND NEW and no one has ever opened the package before them. We all know how most electronics are heat shrink wrapped for the very same reason – phones, tablets and other small electronics. This is SUPER important if you sell any kind of product that’s ingested – like food or vitamins, supplements and similar products. You want to seal such products/packages for your customers to be 100% sure that the product hasn’t been opened before it arrives. 2) Package together loose products. Sometimes you just need to package together lose products so they stay “in one piece”. For example if you sell packs of 10 golf balls – you can easily shrink wrap them together and it will be MUCH cheaper than to pack them in cardboard boxes. And with products like golf balls – that cardboard box is basically a waste of money as it isn’t needed to protect the product. 3) Secure boxes for FBA. This is the main reason why I use heat shrink wrapping in my business. I have products that come in cardboard boxes and to be sure that everything stays in place during the shipping, unloading and order picking process at Amazon, we heat shrink wrap boxes like these. This may not be that important if you ship goods to customers directly as then you can carefully pick the item/box from your warehouse and pack it securely before postage. But if you do use a 3rd party warehouse for distribution, I highly recommend you heat shrink wrap products for maximum safety! That is unless your products already come securely packaged from your supplier. 4) Create a professional look. Yes, sometimes you just want to add that million dollar look to your products, for no other practical reason! Items that are shrink wrapped usually look better – more expensive – as that plastic gives that extra layer of shine to your packaging/box. Take for example greeting cards – they are usually packed in plastic bags (not shrink wrapped though) – as printed designs/paper look SO MUCH BETTER when you look at them packaged in some kind of clear plastic. Silly, I know – but it is what it is! 5) Reduce the size of a product. Heat shrink wrapping can be a great way to reduce the SIZE of products that are fluffy and take up too much space. For example, if you sold plain envelopes – packs of 100 – shrink wrapping can reduce the size of the package by at least 50% as you’ll take out all the air and compress items into a smaller space. This can be a great trick for people whose items are just above the large letter size limit. 6) Protect product from scratches. If your item doesn’t have any outer packaging and is easily scratched, heat shrink wrapping can greatly reduce the chances of your item getting scratched in storage and during the shipping process. 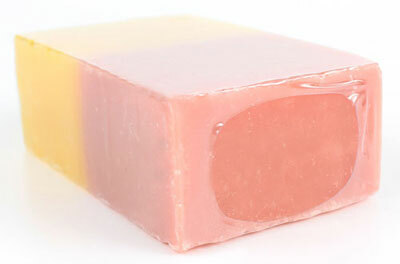 For example if you sell glass products or vases or acrylic products that are so easy to scratch. 7) Hide product details from 3rd parties. There are coloured films available, in black and other colours so you can wrap the product and no one will see what’s inside the packaging. This can be used in sensitive niches, like adult products or health supplements, to keep eyes away from the content of the package. 8) Reduce product packaging costs. As I already said, in retail this is the most important aspect and why heat shrink wrapping is so popular! Cardboard boxes can be expensive, especially if you can’t pack that many products in them. You can greatly reduce your packaging costs by using plastic shrink wrap instead of boxes. 9) Protect products from dust, mist, insects. Again, this mostly applies to ingestible/food items but even in other cases, you may want to protect your products from dust, mist and insects while storing them in your warehouse or say FBA (I hope there are no insects over there though!). We all know how a product can “lose its pristine look” when it sits on a warehouse shelf for 6 months. Shrink wrap your products so your customers always receive brand new products with that just out of factory look! 10) Create bundles of products. Yes, you can even use heat shrink wrapping to create bundles of products. For example you sell some kind of cosmetics set which consists of 10 different sized/shaped items. You could of course create a cardboard box for them, but then you would also need to get some kind of foam inlay/insert to secure items in that box so they don’t rattle while in transit. This is doable of course BUT expensive! With heat shrink wrap you simply package all items together – they’re secured, protected from damage and nothing will rattle inside the package while shipping the order to your customer. 11) Prevent leaks. If you sell liquid products, like lotions, e-juice, some kind of paint and similar products – you want to do a good job of securing that lid/dispenser/whatever so leaks don’t occur during the shipping process. Heat shrink wrapping is the easiest/safest way to secure such items! And if you want to be 200% sure no damage occurs during shipping – shrink wrap items AND put each item in a plastic ZIP bag. This way even if one bottle leaks, the liquid will stay in that one zip bag and won’t ruin the whole package/order. There are many other, specific situations when heat shrink wrap can be a life saver but these are the most common, typical uses. You should look at the products you sell and see if anything needs to be improved/fixed in the packaging side of things. If not, great – you don’t need it! But if for example you get frequent emails from customers saying that the product arrived scratched or in the case of liquids, it leaked – then you should seriously look into heat shrink wrapping to improve your customer experience. So now that we have covered the basics, let’s take a closer look at what materials and equipment you’ll need to start shrink wrapping your products! How to get started with Heat Shrink Wrapping on a Budget! You must be thinking – this all sounds good Andrew but this is going to be very expensive, as it must require specialist equipment, right? Well that’s FAR FROM THE TRUTH! 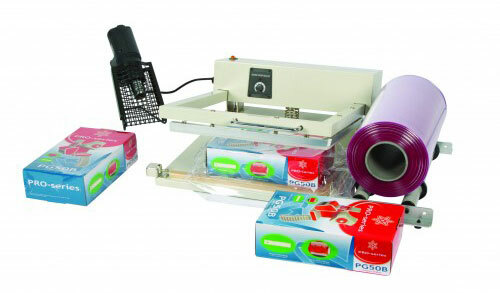 In fact, you can start to heat shrink wrap your products with an investment as little as £10 – £20. Seriously, all you really need to get started is to buy some shrink wrap bags! What are heat shrink wrap bags? These are bags made from the same heat shrink material (plastic) that is used on a more professional level (large rolls). So basically they look like your standard plastic bags, it’s just that the material is specially created to SHRINK when heat is applied! Prices are about 4p to 8p per bag, depending on the size of the bag. So you can get a pack of 100 bags for just £4 – £8 (with free shipping within the UK). That still may sound expensive to you and it is – because you’re buying BAGS (and not rolls of film, more on that later) in very small quantities. If you’re ready to buy more, say 10 000 pieces, you can order these bags directly from suppliers/manufacturers on alibaba.com. Then the cost will go down by at least HALF, if not more. But even with eBay prices, it won’t be that expensive, especially if you deal with small products. Speaking of product size – heat shrink wrapping is really suitable for small to medium sized products. Products that are up to the size of a shoe box. If you need to shrink wrap bigger items, you’ll need to look for special supplies as the stuff I cover in this post won’t really be suitable for you. So going back to the process itself – when you order bags, make sure they’re big enough for your products! Remember, they will shrink when heat is applied so you need a bag approximately 40% larger than your product is. To be safe order a few sizes as a test purchase to see which one fits your products best. This is a special, electrical powered device that will seal (close) the bag. You can purchase professional sealers or more affordable ones on eBay – like the image and link above for around £20. For small volumes this should be enough and you don’t need a professional device for this. 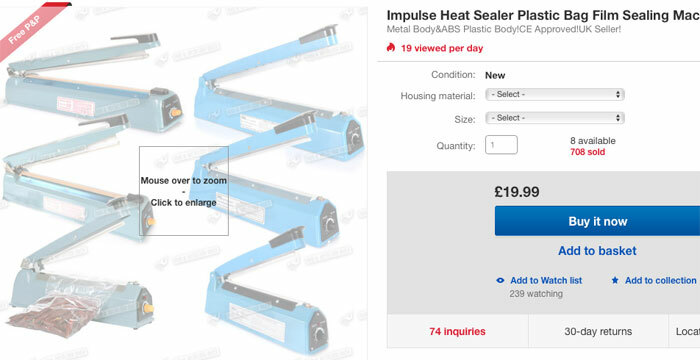 Essentially these impulse heat sealers are very simple devices where the strip is heated to a certain temperature and plastic is sealed between them. So there’s on last bit left, right? How to apply HEAT! 1) You can simply use a hair dryer! Yes, if it’s a decent hair dryer with a hot air function, it will be good enough to shrink wrap these plastic bags! Depending on how powerful your hair dryer is, it will take between 10 to 30 seconds to fully shrink wrap a medium sized item. 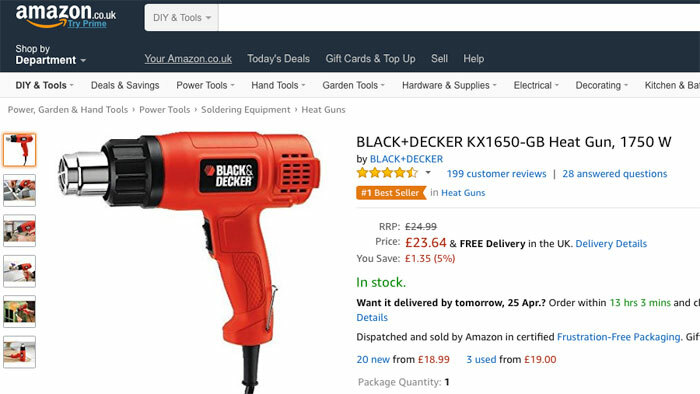 A heat gun will be more effective than a hair dryer as it will produce much hotter air which means that it will take less time to shrink the plastic. Be careful though, don’t be too aggressive with it as you can quickly and easily ruin the film if you over-heat it. 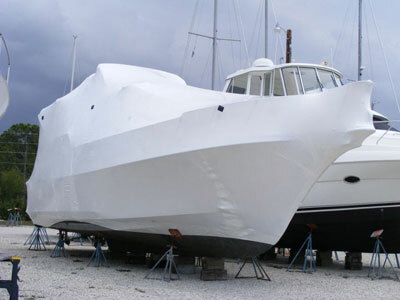 Not a big deal of course, just remove it and start again – no damage done. 3) The last option would be to purchase a special heat shrink wrap gun. These can be pretty expensive, starting at around £100 and going up to £1000 and more for gas powered models. I personally can’t see much benefit of using one for small operations. At the end of the day they will do the same thing as a hot air gun, at a much higher cost. So the best option in my opinion is to simply use the DIY heat gun as they’re cheap, easy to use and will do the job of sealing your heat shrink wraps! IMPORTANT! You’ll need to practice with the heat gun or hair dryer a little bit to learn how close you need to apply the heat, how the plastic reacts around corners etc. It’s a very interesting process (as you’ll find out!) so just do 20-30 as practice. The most common mistake people make is they OVER-HEAT the plastic! When you do, it will simply split and you’ll have to start the whole process again. So start slow – at a distance – and see how the plastic reacts when you move closer with your heat source. The bags you can purchase also come in different thicknesses – the thicker the plastic, the more difficult it will be for you to ruin it. Though sometimes you don’t want that very thick plastic wrapped around your product so I recommend getting several samples of different thickness plastic so you see in real life which type is most suitable for your product and type of application. IMPORTANT! When you apply heat to plastic, it will produce some level of plasticky smell. So I would recommend doing this process in a well ventilated area or ideally even outside – as if you do this for several hours, you may get dizzy and the room you’re doing it in may smell like a plastic factory! Does this all seems too much work to you? Too much hassle? Too expensive and slow? 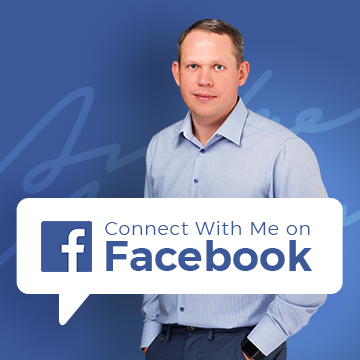 The process I covered will be good enough for people just starting out, for people on a budget or simply for people who just need to wrap a relatively small amount of products – say up to 100 or so per week (you can then do this once a week and get the job done in 1-2 hours). But what if you need a bigger operation? To shrink wrap hundreds of items per day? What if you are not happy with the cost of wrapping being 5p or more? What if your time is too valuable to do such a manual process? Do you need super expensive manufacturing equipment? Not at all! There are actually very affordable solutions available nowadays for mid to even high level production. Let’s take a closer look at what I’m talking about. First of all – cost wise – those pre-made bags are expensive if you compare them to ROLLS of plastic, which is essentially the same thing. Depending on the size of the item, the cost of material when using rolls of wrap instead of bags will be as much as ten times cheaper (or even less) which means that the actual costs of material will be less than 1p per wrapped item! Another advantage of using rolls over pre-made bags is that you won’t be limited to any specific size. You can use rolls in a more flexible way and pack bigger or smaller products using the same roll. They do come in different widths though so you’ll have to calculate the maximum width you’ll need. Or simply purchase several rolls of different width… they’re not that expensive if you go for the cheapest PVC style. Basically it works in the same way as the Impulse Heat Sealer used for bags with the difference that it seals 2 sides at once! The 3rd side, is already closed as that’s how they come in the rolls (folded in half). And last – 4th side – is already sealed from the previous item you sealed (hope that makes sense). So by using film on rolls and a L-Bar sealer you’ll greatly reduce your cost of operation. How to take care of the heat application process? There are several options available – you can still do it with the hot air gun, there’s nothing wrong with that! If you don’t require that many applications per day, it’s still a perfectly fine way of doing it. Even in many Chinese factories they use this approach – it’s cheaper for them to pay someone to do this job manually than to invest in more expensive equipment that does the work automatically (not sure I agree with that approach though). But if you do need higher volume production, there are machines that can achieve this. The first option would be to simply purchase a HEAT TUNNEL. It’s basically a heat chamber with a conveyor where you put your item on one side, then it goes through the machines (heat) and on the other end you receive the final heat shrink wrapped item. You can find goods deals on used heat tunnels on eBay or via specialist suppliers or you can buy directly from China. I don’t have any experience with Chinese models so can’t really comment on how reliable they are. In general, I usually don’t recommend buying such machinery from China as you never really know what you’ll get plus you won’t have proper service in the UK for parts or if something breaks down. But branded models in the UK will cost around £1000 or more. So it is quite expensive for just the heat tunnel alone. 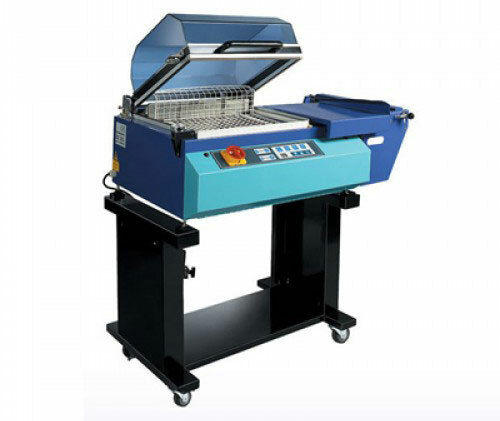 This machine does all the work in one go – it holds the roll of plastic, it seals those 2 empty sides and it applies heat! Basically it’s a complete heat shrink wrap station where you can shrink wrap hundreds of items per hour, saving money on work hours and film costs. There are various sizes and brands available of course but the smallest range starts at about £1500 + VAT. Here’s a good deal from Raj packaging. I hope you agree – £1500 is not that high an amount for such a high volume machine that will create very professional results, save costs on materials, and save time as well. As I said, if you’re a small time seller, you don’t need such a machine – you can use the bag approach OR get a L-Bar sealer to use it with rolls of film instead of bags – results will be the same as with these more expensive machines! You have to look at how many items you need to wrap in a day or week and then consider which option is most time and cost effective for you. So here it is – a lazy man’s guide on heat shrink wrapping. This is not mandatory, don’t get me wrong. Not all products should be shrink wrapped and in some cases it could cause more damage than good – for example delicate products that can be easily bent or say products that would take a different shape when shrink wrapped (fake flowers come to my mind or say wigs). So don’t do this if it doesn’t fix a problem or offer some sort of advantage to your products and/or customer experience. IMPORTANT! Do not confuse heat shrink wrapping with VACUUM packaging – these are two different things. With heat shrink wrapping you apply heat to shrink the plastic so it takes the form of the object, with vacuum packaging you remove all the air and seal it to create a vacuum. While in theory heat shrink wrapping can also create a vacuum, it’s not used for that purpose as it will never be a guaranteed vacuum due to the way film is not sealed as securely as with the vacuum packaging method. One thing – I already mentioned that this is plastic – not the most eco-friendly material to use. So if you’re selling some kind of eco/green product, you’ll probably want to look for alternatives. OR you can look into bio-degradable heat shrink films, which are more expensive but at least the use of it won’t go against your business principles. If you’re selling FOOD items, make sure to use film that is certified to be used with food products! They’re not expensive and will guarantee you that there is no smell or leaking chemicals to worry about. You wouldn’t want to use the cheapest PVC film for food products. I would also stick with UK/local suppliers for such film so you know 100% that all certificates are in place and you don’t have to worry about the authenticity of the film. OK, that’s it for today! I hope this has been valuable and if you want me to cover more product packaging tips in future, make sure to leave your suggestions below this post. Hi there, suggestions for the type of wrapping used for shipper boxes? Seems to me it is a slightly thicker plastic that wraps the cardboard boxes for shipping, at least sturdier plastic than the plastic wraps displayed in these videos in your article. I’m needing to shrink wrap a product in shipped in a 6″x8″x9″ box. Thank you kindly for any suggestions! This plastic is available in various thicknesses so you can get a more durable type that will be suitable for shipper boxes. Just ask wrapping material suppliers about this. No, it won’t really work that way…. you need to shrink wrap the whole item for it to look good. Your article was very enlightening/informative. I’m wanting to “apply” a design to a glass globe ornament (small and medium sizes) and sell the ornaments. I’d just be starting so a large production system wouldn’t be needed. My question is will round glass items be easy to shrink wrap individually as they will be sold individually—at least in the beginning. Example is to sell them at an event/show for personal use to hang at home or on a Christmas tree. I’d be using same design on each ornament, at least to start. I have never shrink wrapped ROUND items so don’t know how well plastic shrinks around them…. 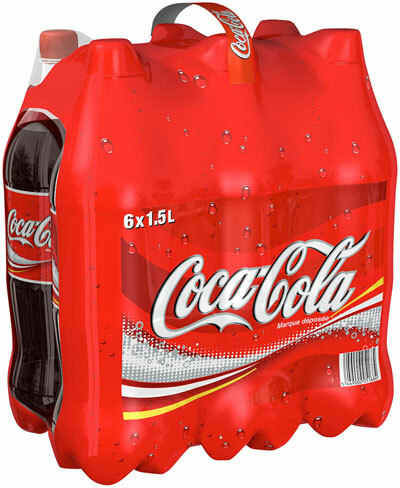 Have you seen similar products/similarly shaped products being sold shrink wrapped? If you do this, you will probably need the thinnest film you can get – 12 micron or even lower.